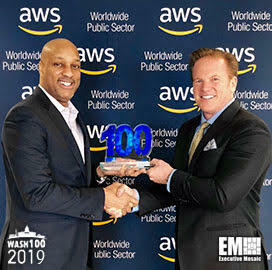 Jim Garrettson, founder and CEO of Executive Mosaic, presented David Levy, vice president of the federal government at Amazon Web Services, with his second consecutive Wash100 Award on Wednesday. Executive Mosaic is ecstatic to present the most coveted award in government contracting recognizing Levy for leading Amazon and cloud adoption initiatives for federal agencies. Levy joined Amazon in his current role in May 2017. He leads the company’s business with government, enterprise and nonprofit customers to maximize the potential of emerging technologies enabling them to transform their organizations and fulfill their missions. Previously, Levy spent 12 years with Apple as the head of U.S. government sales, assisting the government with mobile technology modernization between 2005 and 2017. In addition, Levy co-founded Sulla Technology Group and helped build a successful data center services company focused on higher education clients, state and local governments. He also started Empire Capital Management which focuses on investment needs for mid-market institutional clients. Levy earned his bachelor’s degree in international economics from Texas Tech University in 1992.